Created by Water is Life, with help from DDB New York and teams and Carnegie Mellon and the University of Virginia, “The Drinkable Book” is a water filtration system that has the power to reduce bacteria by over 99.99%. Cheap to produce, innovative, and education, “The Drinkable Book” might just be the most impressive water filtration resource ever created. Invented by chemist and scholar Dr. Theresa Dankovich, the book uses a brand new type of paper that works like “a scientific coffee filter.” Each piece of paper in the book contains chemical properties that kill deadly bacteria found in unfiltered water; each page is also printed with information on why having access to clean drinking water is so important. Perhaps the best and most impressive facet of “The Drinkable Book” is in its design, coupled with the impressive scientific advances that made it possible. The book is small and easily transportable, and each page, or filter, can provide up to thirty days of clean water. According to Water is Life, each book contains enough of these technologically advanced, paper-light filters to provide clean water for four years. 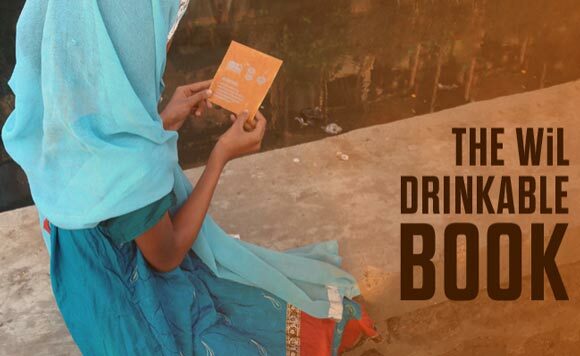 If every family had “The Drinkable Book,” entire countries wouldn’t have to risk catching deadly diseases from their drinking water, and millions of lives would be saved. According to its Mission Statement, Water is Life is dedicated to providing clean water and sanitation and hygiene programs, as well as helping to transform communities and save lives around the world. “Water is Life provides clean drinking water, sanitation and hygiene education programs to schools and villages in developing countries. We provide opportunities for others to be involved through fundraising and field project implementation,” the organization explains. With this in mind, it’s no wonder that the organization is committed to innovating the ways in which developing countries understand sanitation, but how they can filter safe drinking water for themselves and their communities.